Birmingham has a relatively compact downtown, wide sidewalks, and sweeping courtyards, making it an ideal location for a “runseeing” tour of the city’s popular tourist attractions. While there are other historic sights to see in neighborhoods like Edgbaston and the Jewelry Quarter, this quick 2.7 mile loop hits a number of the man sights. Start out admiring the grand architecture in Cathedral Square and head southeast out of the park on Cherry Street. When you reach the corner of Union and High Streets, take a right and meet up with New Street, home of the Bullring and the city’s greatest strip of shops. 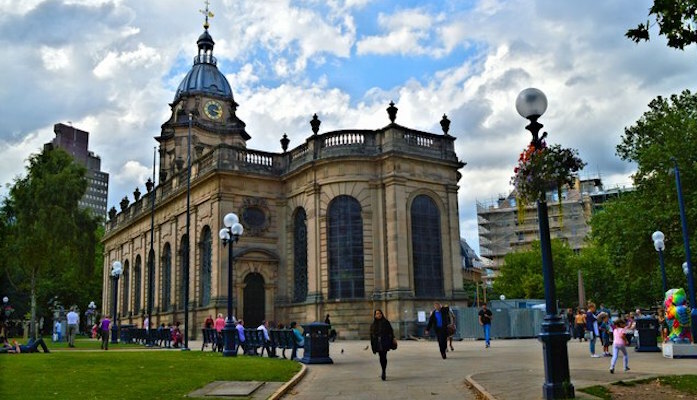 Take a right on New Street and continue through Victoria Square and Chamberlain Square, passing the Birmingham Museum and Art Gallery. From there, you’ll take Fletcher’s Walk to Centenary Square, and meet up with the beautiful canal towpaths. Follow the towpaths out past Symphony Hall, Brindley Place, and the Gas Street Basin. Once you reach Symphony Court, cross over to the other side of the river to complete the loop — but not before taking one last detour to marvel at the stunning St. Paul’s Church. Add-On: For a longer run, head to one of the nearby canal trails, or use our tour of the Jewelry Quarter, or do the 1.75 mile loop around the Edgbaston Reservoir.